The move will help the app gap in Chrome OS, and how. Google's Play Store for Android will be coming to Chrome OS, the lightweight operating system that powers Chromebook laptops, the company announced Thursday. That means Chromebook users will be able to download and install apps made for Android onto their Chromebooks, expanding the base of applications available for those devices. Previously, Chromebooks were able to run only applications built for Chrome. It's an important enhancement for Chrome OS, which Google has been touting as the perfect operating system for schools and businesses, but which is lacking applications compared to Android. By bringing the two together, Google will expand the utility of both Android apps and Chromebooks. 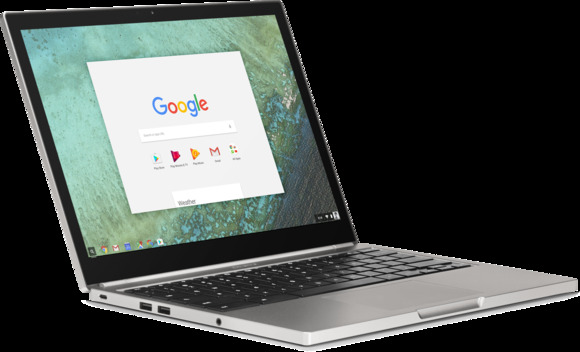 While Chromebooks have already been successful in the enterprise, they were lacking app compatibility, said Rajen Sheth, the director of product management for Android and Chrome for Business and Education. This update will better equip businesses and schools with apps they want, without requiring the developers of those apps to build a separate Chrome app, Sheth said. Chromebook shipments overtook Macs in the U.S. during the first quarter of this year, according to IDC. Building on that success by making Android apps available to those users should make the platform more appealing to buyers. Chrome OS users will now be able to write term papers on their Chromebook while also checking Snapchat, Kan Liu, Google's senior director of product management, said at the company's I/O developer conference in Mountain View, California. With the Chrome OS Files app, users will be able to keep files in sync across both Android and Chrome apps, too. Android apps will be able to run in three different window sizes, and users will be able to receive Android notifications on Chrome. Enterprise administrators will be able to push applications down to devices through a centralized process and can control which apps are available through the Play Store using the Play for Work API. Administrators concerned about the security of the system can also disable the store altogether. It's all powered by a containerized Android framework that runs on top of the Chrome OS. Apps will be running on the latest version of Android, with the latest security patches, so users can ensure that their apps will stay secure, Liu said. What's more, the architecture of the system will allow Chromebooks to work with just about every Android app, as long as devices have the hardware to support the applications' needs. This is a feature Google has been working on for a while, but this is the first time the company has shown off more of the technical details of the app integration. The move to create a cross-functional app platform across both a desktop operating system like Chrome OS and a mobile OS like Android isn't unique to Google. Microsoft is trying a similar approach with Windows 10, allowing developers to build Universal Windows apps that run on computers, tablets, and phones. Like many of the other announcements Google made at its I/O developers conference this week, the Android apps integration feature won't be available for consumers until this fall. Developers who want to test their Android apps on Chrome will be able to use the Asus Chromebook Flip, Chromebook Pixel, and Acer Chromebook R11 starting in June.